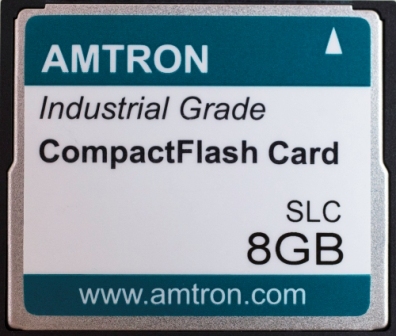 Amtron supplies the following industrial grade CompactFlash (CF) Cards to military, medical, and industrial customers. 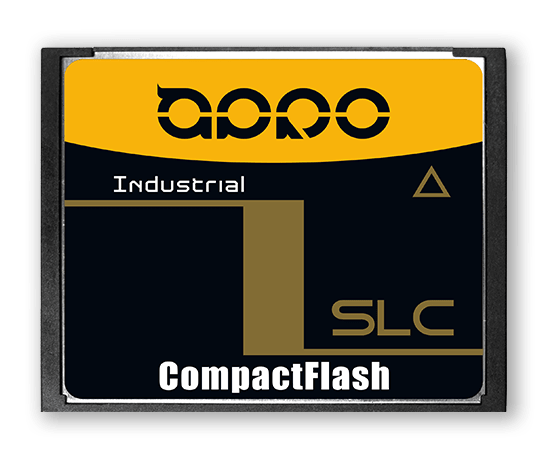 These authentic industrial grade CompactFlash (CF) cards are designed for industrial, medical, and military applications and are much more durable and reliable than the consumer grade CF cards. 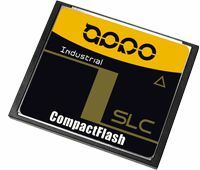 These high speed industrial grade Compact Flash (CF) cards are designed to perform at the highest degree of reliability and compatibility for customers in the aerospace, computer, defense, networking, telecommunication, transportation, and many other industries for monitoring, mass data collection/storage, and write intensive mobile and embedded computing and automotive applications. One of Amtron CF cards and many of Amtron PCMCIA ATA Flash cards have National Stock Number (NSN) assigned by the U.S. Defense Logistics Agency (DLA). Packaged in CF Type I housing (rugged metal casing or optional plastic casing), Amtron industrial grade Compact Flash memory cards are available from 128MB to 16GB and in standard temperature grade (0°C to +70°C) or industrial extended temperature grade (-40°C to +85°C). Free plastic travel case is provided. * ETA: expected time of arrival. The lead time is about 3 weeks after customer places order. Please click "Add to Cart" or contact Sales Department at sales@amtron.com or (323) 265-8076 to place order. Please contact Sales Department at sales@amtron.com, phone (323) 265-8076, or fax (323) 488-9747, to inquire the most updated pricing and lead time provided by the manufacturer. * Different disk modes and data transfer modes, with suffix -PF/-PR/-PA/-UF/-UR/-UA/-AF/-AR, are also available at the same price as -AA. If applications call for particular modes, please check the following Table for suffix decoder. Packaged in Type I (3.3 mm thick) plastic or metal housing, Pretec Lynx series CF memory cards are available from 128MB to 32GB and in industrial standard temperature grade (0°C to +70°C) or industrial extended temperature grade (-40°C to +85°C). Free plastic travel case is provided. Auto-sensing: automatically switch to "fixed disk mode" on IDE bus or "removable disk mode" on PCMCIA (PC Card) bus; also automatically detect data transfer mode and switch to "PIO mode" or "Ultra DMA (UDMA) mode". Non-auto-sensing cards are available and made-to-order at the same price as the auto-sensing cards. Please contact Sales Department at sales@amtron.com to place order. Please contact Sales Department at sales@amtron.com or (323) 265-8076 for price, lead time and order information. Please click here for CompactFlash Card PCMCIA Adapter. Please click here for CompactFlash Card Expresscard Adapter. Authentic industrial grade flash memory products are designed and manufactured for industrial and military applications that require the highest degree of reliability. The authentic industrial grade flash memory products are built to endure severe operating environments such as extreme cold and hot temperatures, continuous vibration, high shock impact, intensive read-write cycles, etc. The industrial grade flash memory products feature vital benefits such as wear-leveling, write protection, error correction, sustained write speed, etc.. Such features are essential to industries that require a more robust digital storage option to ensure reliable and repeatable operations. 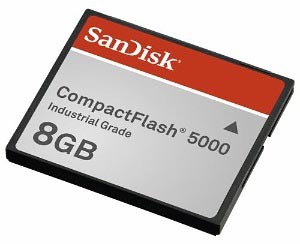 Consumer grade flash memory products are built with the much cheaper and less reliable controller chipset and flash memory. Some manufacturers of popular consumer-grade memory products qualify their lower-cost memory products as "industrial grade" memory products simply because the components can survive the industrial wide temperatures and sometimes maybe the vibration and shock conditions. However, these "industrial" consumer-grade memory products are not durable and reliable. At the beginning the low pricings of these so called "industrial-grade" memory products are very appealing but eventually the reliability problem will appear. Amtron, APRO , Pretec, and SMART CompactFlash (CF) Cards are compatible with Western Digital (WD) / SiliconSystems* SiliconDrive CF Cards. Amtron and APRO's auto-sensing design makes Amtron and APRO CF Card an all-in-one product that envelopes the SiliconSystems SiliconDrive CF Cards including SSD-Cxxx(I)-30xx series, SSD-Cxxx(I)-31xx series, SSD-Cxxx(I)-35xx series, & SSD-Cxxx-4xxx sries. The letter (I) in the SiliconDrive part number SSD-Cxxx(I)-3xxx stands for "Industrial Wide Temperature Range, -40°C to +85°C". Without the letter I, it means "Commercial (Standard) Temperature Range, 0°C to +70°C". The corresponding Amtron part numbers are CFC-SUxxxxC, where C stands for Standard (Commercial) Temperature Range , 0°C to +70°C . The corresponding APRO part numbers are SRCFCxxxx-HACSC-AA, where the S and C stands for Standard (Commercial) Temperature Range , 0°C to +70°C. *Auto-sensing: automatically switch to fixed disk mode on IDE bus or removable disk mode on PCMCIA (PC Card)bus; also automatically detect data transfer mode and switch to PIO mode or Ultra DMA (UDMA) mode. 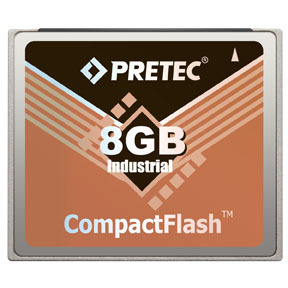 1 year warranty for Pretec Industrial Grade CompactFlash Cards. Free technical support from Amtron Technology and respective manufacturers.